One of the highest lights of my trip to Brazil was the cruise on the Black River of the Amazon. I was really blown away by the reflections of the jungle foliage on the black water. I did a series of seven paintings of Amazon Reflections, of which this is number three. Notice all the violets, reds, and blues in the shadows, that make the oranges and green light passages pop by juxtaposition. Also the reds and blues that accent those lights and the mirror effect of the reflections that in some places make it hard to tell where the water and shore meet. 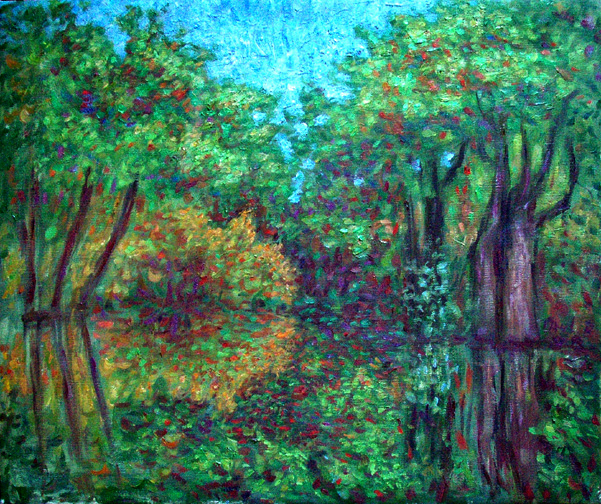 PaulB's Pointillistic/Impressionist original oil paintings of Brazil and the Amazon various prints and poster formats of a wide variety of subject matter by the Pointillistic/Impressionist oil painter from landscape/waterscape paintings, dance, sports, portrait, to classical figures, flowers, rock and roll, Brazil, and Amazon Reflections paintings and prints are available for purchase for as little as $24.95 for an 8" x 10" matted print on photo pape. Pointillistic/Impressionist Giclee prints of Brazil on real canvas or heavy watercolor paper are available. One of a kind Brazil and the Amazon embellished prints, which are Giclee prints retouched in genuine oil paint by PaulB. Unless noted PaulB's original Pointillistic/Impressionist oil paintiings are oil on canvas. Paul Berenson's pointillistic/Impressionist oil paintings are in privale collections around the world, including the downtown Los Angeles Athletic Club and have appeared in numerous publications, including the New York Philharmonic Playbill. PaulB.com also builds websites and PaulB is a member of the LA Web Professionals Group.